1) WE SAID: Easy monetary policy might be a source of financial bubbles. If so, monetary policy can’t be dismissed as a tool to prevent financial instability. I would call the question “leading the witness”, but let´s ignore that. The tacit understanding is that “easy” policy means low interest rates. And “easy” monetary policy brings out the worst in people. More likely, “monetary policy creates problems that regulators (if they are doing a decent job) can´t”. As I wrote recently on that “diploma-loosing” remark by Harvard´s Jeremy Stein, it´s like saying that interest rates have “drone capabilities” (“Find them wherever they are and kill them!”). Macroprudential policies are more akin to regular “foot soldiers” that would not get in all the cracks of the “target area”. WHAT IT MEANS: Mr. Tarullo, a central player in this debate, sees macroprudential policies as a speed bump to slow the advance of financial excess, but argues that “monetary policy action cannot be taken off the table as a response to the build-up of broad and sustained systemic risk.” Put another way, if a new bubble emerges, Fed officials will be considering whether they need to stamp it out with higher rates. Yes, by all means do it, no matter that you would likely “throw the baby out with the bathwater”. The 2008 transcripts paint the FOMC in a Quixotic fight against an imaginary inflation evil. All along it is said that policy is “accommodative”. In his “valedictory” speech Rick Mishkin tried hard to dispel member’s ingrained notion that the Fed Fund rate is a good indicator of the stance of monetary policy. Even Mishkin over the last few years, maybe not to feel isolated, has moved closer to the “dark side” (this story is told by the subtle changes in the revisions to his famous Money and Banking textbook). And that´s exactly what I´ll do, but only in my next post, which I´ll write during the pagan celebrations called Carnival, that starts warming up tomorrow and then heats up to Tuesday´s climax! I set up Smithers & Co in 1989 as an economics consultancy. Much of the comments on economics and markets that I read as a fund manager struck me as nonsense and I have had great fun in pointing this out to clients over the years. I now have the opportunity to disseminate my views more widely and hope that this will amuse and inform readers. From his latest post I agree with the “amuse” but strongly reject the “inform”. Abenomics – the policy endorsed by Shinzo Abe, the Japanese prime minister – aims to raise the country’s growth by getting rid of deflation. It is based on two myths. The first is that the economy has done badly and the second is that it has been hurt by deflation. The first myth comes from judging a country’s economic success by its gross domestic product. Japan has a falling and ageing population. If allowance is made for this, Japan has been the most successful(!) of all Group of Five leading economies. It is the country whose GDP at constant prices per person of working age has grown most rapidly, at least since 1999. The solution for the US is clear: Retire 20% of the working age group and the economy will bounce strongly. My take indicates something very different. 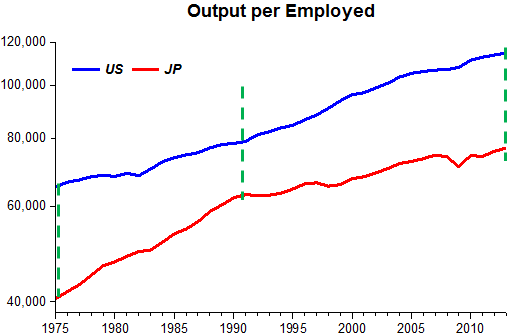 The chart shows that Japan did very well relative to the US from 1975 to 1991, closing about half of the output gap per employed person (that by law has to be of drinking working age). Over the last 22 years the gap has opened up and is back to almost exactly what it was in 1975! 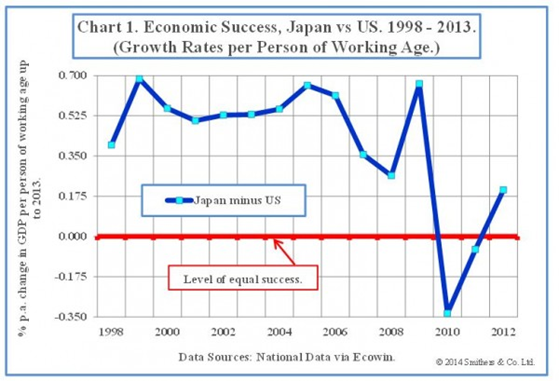 Japan’s relatively slow growth is the result of demography, not deflation. Japan grew slowly after its stock market collapsed in 1990. Prices rose to 1998 and then fell as inflation gave way to deflation. While prices rose the economy grew more slowly than it did while prices fell. He forgets that the jump in prices in 1997 (and drop in output due to tightening monetary policy) was due to a rise in the consumption tax rate (CT). By 2002 output was even lower than in 1997, and through all those years prices (CPI) fell (i.e. there was deflation). Suddenly, after 2002 output takes off and prices stop falling. He probably doesn´t know but that was the period Japan undertook QE “light”. That continues through 2007. Then the oil shock hit soon followed by the international crisis. Initially prices rise and output falls. Prices then fall and output bounces back (as expected following the reversal of the supply (oil) shock). 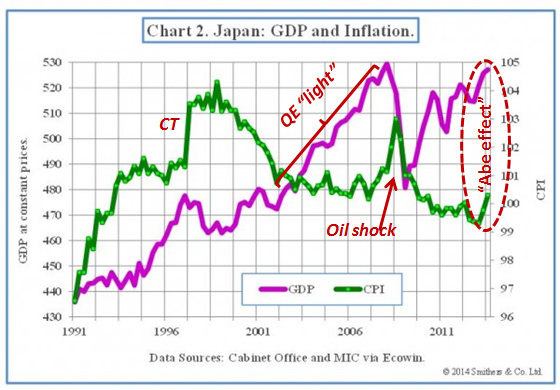 At the tail-end of the chart we glimpse the beginnings of the “Abe effect”. Mr. Abe, don´t listen to Mr. Smithers, “keep on walking”. Let´s see. For his memoirs as Fed Chairman Greenspan pocketed 8 million from Penguin. Given PCE inflation Bernanke should get at least 9 million from the same editor. But Bernanke´s book is worth more. Greenspan presided over the Great Moderation. Great Moderations don´t give rise to dramas as does a Great Recession (Lesser Depression). Then there are all the jostling’s over the rescue of financial institutions (that should be the boring part of the book) and how the Fed avoided a second Great Depression. I wonder if Bernanke will also conclude that “non-monetary” forces were responsible for the big fall in employment and depressed state of output that characterizes his tenure. That wouldn´t surprise me. He has done it before regarding the Great Depression with his famous article “Non-Monetary Effects of the Financial Crisis in the Propagation of the Great Depression”. He will certainly have to be paid more (maybe much more) than Greenspan because he will have to be a genius to convince people that he was not responsible for something very bad. Greenspan only “confessed” that he was not responsible for something good – a long stretch of low inflation, low unemployment and stable real growth! Third, there is the Jeremy Stein argument. In some cases monetary policy — i.e. higher interest rates — might be the preferable tool for addressing bubbles and threats to financial stability. That’s because monetary policy finds problems that regulators can’t. But I think it is more than simply a diplomatic effort to seek a more agreeable tone. The central bankers and finance ministers seemed actually to agree that a gradual and transparent tapering of UMP is appropriate now, regardless of what they think of the past effects of UMP. I do not see the evidence that these models led policy makers astray or were a cause of the financial crisis. To the contrary I have argued that the general policy recommendations of these models—which generally took the form of particular monetary policy rules for the interest rate instrument—were not followed by policy makers in the years leading up to the crisis though they followed them during the Great Moderation.Ignoring the recommendations was the problem rather than the recommendations themselves. These models did not fail in their recommendations. Rather the policymakers failed to follow the recommendations. 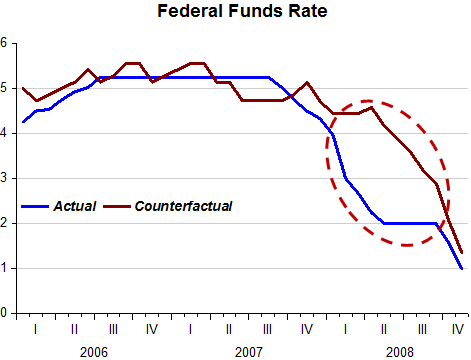 But as the chart shows, if the Fed were following the rule after late 2007 things would likely have been much worse. All the way to the ‘brink’, the “rule-rate” (the counterfactual rate) was significantly above the actual rate. First of all, let me talk about the issue of focusing too much on the federal funds rate as indicating the stance of monetary policy. This is something that’s very dear to my heart. I have a chapter in my textbook that deals with this whole issue and talks about the very deep mistakes that have been made in monetary policy because of exactly that focus on the short-term interest rate as indicating the stance of monetary policy. In particular, when you think about the stance of monetary policy, you should look at all asset prices, which means look at all interest rates. The stance of monetary policy was incredibly tight during the Great Depression, and we had a disaster. In the August 5 FOMC meeting, Mishkin´s last, the inflation worry was alive and well, maybe more so than ever! There were two options on the table regarding policy. In the first (Alternative B), the Committee would maintain its current policy stance but would underscore its concern about inflation. In the second (Alternative C) the Committee would firm policy by 25 bp. Janet Yellen was the only participant that wanted to downplay risks to inflation. Most thought that monetary policy was accommodative. Charles Evans (of Evans-rule fame) would feel comfortable with Alternative C and thought an increase of 50 to 75 basis points in a reasonably short period of time would be needed! Richard Fisher and Thomas Hoenig favored C (but only Fisher dissented). James Bullard wanted to “prepare markets for a rate increase in September”. Charles Plosser shared his feelings. Mishkin and Rosengren leaned towards Yellen´s language. The charts show the information – on inflation, inflation expectations and oil prices– available to the FOMC at the time of the meeting. Oil prices had peaked a few weeks earlier and then dropped significantly. Inflation expectations both at the shorter and longer horizon had also fallen. In particular, the close correlation between shorter (5yrs) inflation expectations and oil prices had “broken” two weeks earlier, pointing to other influencing factors in addition to the fall in oil prices. Maybe that´s associated with the perception that the Fed was on the brink of tightening (remember that the June Meeting Minutes said that “the next interest rate move will likely be up”). Plosner (July 22): Keeping policy too accommodative for too long worsens our inflation problem. Inflation is already too high and inconsistent with our goal of — and responsibility to ensure — price stability. We will need to reverse course — the exact timing depends on how the economy evolves, but I anticipate the reversal will need to be started sooner rather than later. And I believe it will likely need to begin before either the labor market or the financial markets have completely turned around. However, like the 1970s, monetary policy is currently accommodative(! )…In this environment there is a significant risk that inflation and inflation expectations could move higher in coming months. Thus, it will be important for the Federal Reserve to monitor inflation developments and inflation expectations closely, and to move to a less accommodative stance in a timely fashion”. What I’d like to spend some time on—because I feel this is sort of my swan song, but maybe because I’m a classy guy, I’ll call this my “valedictory remarks”—are three concerns that I have for this Committee going forward. I’m not going to be able to participate, but I have a chance now to lay them out. The first is the real danger of focusing too much on the federal funds rate as reflecting the stance of monetary policy. This is very dangerous. I want to talk about that. Second is that I think it’s absolutely critical that we keep our options open in the current circumstances, and so I want to talk about that. The third is on the communication issue, but it’s not going to be on inflation objectives. I’ve already talked about that enough in public, so it’s clear to you one way or the other. I hope you consider it, but that’s something that I don’t need to go into here. All asset prices have a very important effect on aggregate demand. Also you should look at credit market conditions because some things are actually not reflected in market prices but are still very important. If you don’t do that, you can make horrendous mistakes. The Great Depression is a classic example of when they made two mistakes in looking at the policy interest rate. One is that they didn’t understand the difference between real and nominal interest rates. That mistake I’m not worried about here. People fully understand that. But it is an example when nominal rates went down, but only on default-free Treasury securities; in fact, they skyrocketed on other ones. The Japanese made the same mistake, and I just very much hope that this Committee does not make this mistake because I have to tell you that the situation is scary to me. I’m holding two houses right now. I’m very nervous. [Laughter]. The third issue is something about which I am less constrained, which is communications. I would not have talked about this earlier, but it really does worry me. We have a complicated governance structure in this Committee, which I actually think is the right governance structure. We have two types of groups that vote on this Committee. We have the people who are Presidential appointees and then confirmed by the Senate, who are Board members, and I will soon not be one of them. I’ll be a civilian again. Then we have Bank presidents, who are much more tied into the private sector because your boards of directors, which are composed of private-sector people, recommend you. Then we do have some role, but they’re the primary people who decide who becomes a Bank president. I think that’s a very good framework. It actually serves us very well. I’ve been on both sides. I’ve been on the other side of the fence, not as a president but as an executive vice president. It serves us very well because we have a link to the private sector that we normally would not have; importantly, it keeps us real in terms of information; and there’s a group of people out there who are not in Washington or New York (because people also have a hard time about New York) but who tend to be very important supporters for us politically. 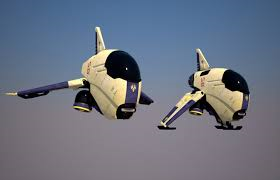 So this is a system that I would very much like to see preserved. It does have a problem because of the different roles here. What I have been very concerned about—and I have had people in the markets speak to me about this—is that recently I had a very prominent central bank governor say to me, “What in the hell are you guys doing?” The issue here is that we need to have a situation where Bank presidents and also members of the Board can speak their views. They may have different views, and I very much encourage that in terms of discussion, of where they think the economy is going, which is what we do inside; and I think that does need to be done outside the Committee because it shows that there are different views, that we’re thinking about it, that we’re trying to learn from each other, and so forth and so on. What is very problematic from my viewpoint are the speeches, discussions, and interviews outside, when people talk about where they think interest rates should head and where the policy rate should head. That’s where the criticism has been coming from. I have to tell you that a lot of people whom I respect tremendously are saying to me that it’s making us look like the gang that can’t shoot straight. I think it’s a really serious problem. I understand that we want to keep the priority of speaking our minds, but we have to work as a team, and I think that we’re having a problem in this regard. But this kind of cacophony on this issue has the potential to damage us in two very serious ways. One is that it weakens the confidence in our institution, and I have to tell you that I love this institution. It’s very hard for me to leave this place, but it’s something I have to do. If the institution is damaged in terms of the confidence that the public and the politicians have in us, it will hurt us deeply. It will hurt us in terms of policy because it will weaken our credibility, which actually will make it harder to control inflation. So I consider this a very serious cost. More than 5 years on, it seems members heard but didn´t listen! As I said, I think our aggressive(!) approach earlier in the year is looking pretty good(! 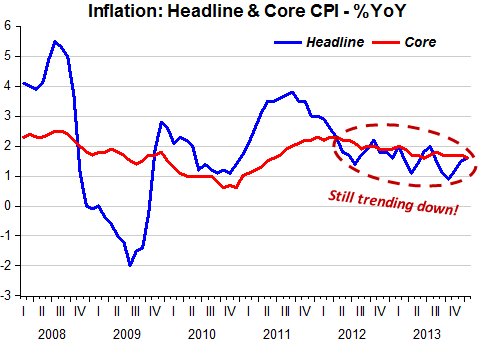 ), particularly as inflation pressures have seemed to moderate. Overall I believe that our current funds rate setting is appropriate, and I don’t really see any reason to change. On the one hand, I think it would be inappropriate to increase rates at this point. It is simply premature. We don’t have enough information. There is not enough pressure on inflation at this juncture to do that. On the other hand, cutting rates would be a very big step that would send a very strong signal about our views on the economy and about our intentions going forward, and I think we should view that step as a very discrete thing rather than as a 25 basis point kind of thing. We should be very certain about that change before we undertake it because I would be concerned, for example, about the implications for the dollar, commodity prices, and the like. So it is a step we should take only if we are very confident that that is the direction in which we want to go. And this is the information on inflation expectations and oil prices that the FOMC had at the time of the meeting! Note that not even oil prices resisted the (now ‘certain’) expected steep fall in aggregate demand! Not surprisingly, it materialized! For the rest of the year, in regular and unscheduled FOMC meetings, what we perceive from the transcripts is a frantic and disorganized search for the “horses that bolted”. PS. There´s one passage in the October 08 meeting that is reminiscent of a November 1937 FOMC meeting. If you think a Tiger is a Cat you´ll get into trouble, just as if you think Interest Rates define the Stance of monetary policy. In our public remarks over much of last year, my colleagues and I stressed a couple of very important messages. First, even with the phase-out of asset purchases, the basic stance of policy remains highly accommodative. To translate, the Committee intends to keep interest rates very low. The second message was that the QE program and the Fed’s policy interest-rate target are two separate tools of policy. Consequently, we can wind down the asset purchases—a program that was meant to provide temporary, supplemental “oomph” to the low interest-rate policy—and preserve the accommodative positioning of policy appropriate for the reality of our economic situation. Of particular interest is Wu and Xia’s observation that their series for the shadow rate exhibits similar correlations with other macro variables since 2009 as the fed funds rate did in data up until the end of 2007. Wu and Xia took a popular model that had been estimated before the Great Recession in which the fed funds rate was used as the summary of monetary policy, and just replaced the fed funds rate with the Wu-Xia shadow rate to get a data set that continues after 2009. Although this device could not fully account for all that happened to interest rates and unemployment during the Great Recession over 2007-2009, Wu and Xia found the evidence to be consistent with the hypothesis that data since 2009 could be described using the spliced series as the monetary policy indicator and using the same model that described pre-2007 data. In other words, the shadow rate displays the same sort of correlation with lagged macro variables since 2009 as the fed funds rate did in earlier data, and likewise the value of macro variables that one would predict using the new shadow rate series is close to the value one would have predicted in earlier data using the fed funds rate instead. The suggestion is that we then might use the shadow rate series as a way of summarizing what the Fed has been doing with its unconventional policy measures such as large-scale asset purchases and forward guidance. If the Wu-Xia framework is correct, these unconventional policies can all be summarized in terms of what effect they had on the shadow short rate. By comparing the shadow rate with the value that traditional models would have predicted for the fed funds rate, Wu and Xia get a measure of the shocks to monetary policy. Wu and Xia find that monetary policy has recently been a bit more expansionary than usual (pushing the shadow rate about 0.6% more negative over 2011-2013 than the traditional monetary policy rule would imply), as a result of which their estimates imply that the current unemployment rate is 0.23% lower than it otherwise would have been. In other words, when you really need it it doesn´t work! I wish that instead of insisting in using interest rates, even if of the shadow variety, to pin the stance of monetary policy, studies would take other paths to that end, maybe studying alternatives like NGDP. 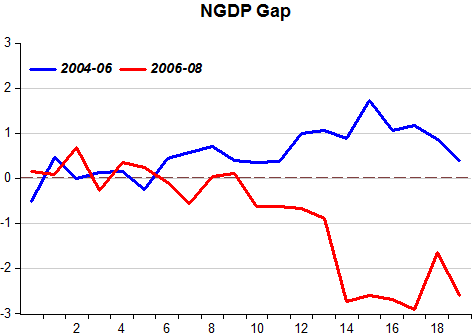 Interestingly, it´s exactly the period covering 2007-09, when NGDP took a dive, that not even the shadow rate is capable of accounting for what happened! For discusions on the “Stance of Monetary Policy” see Scott Sumner and David Beckworth. I expect that the media will have a field day with these. No doubt a number of Fed officials will have said things that, with the benefit of hindsight, they wish they had not said, or said somewhat differently. Jim Bullard, president of the St. Louis Fed, recently gave a speech on the subject titled: The Notorious Summer of 2008. The slides associated with that speech are available here. First, many people think of the financial crisis as beginning in the fall of 2008, with the collapse of Lehman and AIG. In fact, the crisis had been underway for more than a year at that point (August 2007). The fact that the crisis had gone on for over a year without major turmoil suggested to many that the financial system was in fact relatively stable–it seemed to be absorbing various shocks reasonably well. Throughout this period of time, the Fed reacted with conventional monetary policy tools–lowering the Fed Funds target rate from over 5% to 2% over the course of a year. So what happened? Essentially, an oil price shock. 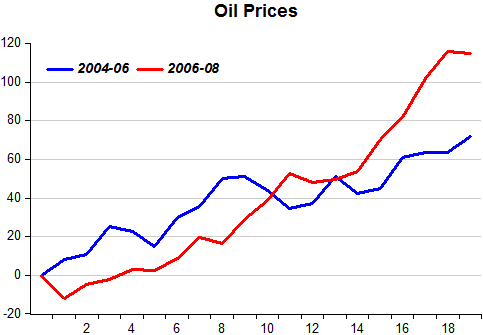 By June 2008, oil prices had more than doubled over the previous year. The real-time data available to decision-makers turned out to greatly underestimate the negative impact of this shock (and other factors as well). The rapidly slowing economy served to greatly exacerbate financial market conditions. Is that it? Are we to understand that all the misery that has followed was the result of a frigging oil shock? I don´t think so, and here´s why. In the last stretch of his tenure Greenspan also faced a quite similar oil price shock. My charts consider two 20 month periods: December 2004 to July 2006 and December 2006 to July 2008. Before putting them up, let´s check the peculiarities as gleaned from the post FOMC meeting statements. August 08 (a “copy-paste” of the June statement): The Federal Open Market Committee decided today to keep its target for the federal funds rate at 2 percent. Voting for the FOMC monetary policy action were: Ben S. Bernanke, Chairman; Timothy F. Geithner, Vice Chairman; Elizabeth A. Duke; Donald L. Kohn; Randall S. Kroszner; Frederic S. Mishkin; Sandra Pianalto; Charles I. Plosser; Gary H. Stern; and Kevin M. Warsh. Voting against was Richard W. Fisher, who preferred an increase in the target for the federal funds rate at this meeting. The tightening expected over the next year is not anticipated to begin soon. As shown in exhibits 23 and 24, options on federal funds rate futures contracts currently imply that market participants expect that the FOMC will stand pat at both this and the August FOMC meetings. Although considerable tightening is priced in over the next year, this is not unusual at this stage of the monetary policy cycle. Exhibit 11 presents the near-term inflation outlook. As you can see in the top left panel, the recent data on consumer prices have come in a little lower than we had expected at the time of the April Greenbook. As shown on line 3, core PCE prices rose only 0.1 percent in April, and based on the latest CPI and PPI readings, we expect an increase of 0.2 percent in May. As a result, we have marked down our estimate of core PCE inflation in the second quarter by 0.3 percentage point, to an annual rate of 2 percent. Total PCE prices (line 1) have risen at a substantially faster pace than core prices; but here, too, the current-quarter forecast is a little lower than in our previous projection, both because of the lower core inflation and because the sharp increases in oil prices have been slow to feed through to finished energy prices. Despite this recent news, we expect inflation to rise sharply over the next few months. In part, this reflects our judgment that core prices were held down in the first half by some factors that will not persist into the second half. In addition, as shown to the right, we expect increases in food and energy prices to push up the twelve-month change in the total PCE price index more than 1 percentage point over the next several months, to about 4½ percent. Unfortunately, and that was to be expected, the “public” gathered that inflation, if not the entire story, was the major part. In the Minutes of that meeting we read that “likely the next move in interest rates will be up”! Sep 05: The Federal Open Market Committee decided today to raise its target for the federal funds rate by 25 basis points to 3-3/4 percent. The Committee perceives that, with appropriate monetary policy action, the upside and downside risks to the attainment of both sustainable growth and price stability should be kept roughly equal. With underlying inflation expected to be contained, the Committee believes that policy accommodation can be removed at a pace that is likely to be measured. Voting for the FOMC monetary policy action were: Alan Greenspan, Chairman; Timothy F. Geithner, Vice Chairman; Susan S. Bies; Roger W. Ferguson, Jr.; Richard W. Fisher; Donald L. Kohn; Michael H. Moskow; Anthony M. Santomero; and Gary H. Stern. Voting against was Mark W. Olson, who preferred no change in the federal funds rate target at this meeting. Note that while in the August 08 statement Richard (Inspector Clouseau) Fisher wanted an immediate increase in rates, in September 05 Mark W. Olson wanted to keep rates pat. The 2005 statement explicitly and emphatically mentions the stability of core inflation. In 2008 the statement eschews any mention of core inflation and is very concerned with rising headline inflation pulled up by oil prices. A big difference in the two statements, to my mind, is Greenspan´s emphasis on “appropriate monetary policy action”. That´s certainly an elusive concept, but maybe a much better form of “communication” than the “lean not lurch” style proposed by Bernanke. The 2004-06 shock is initially stronger than the 2006-08 one. Over the 20 month period the big difference between the two shocks shows up in the last three months. There´s no quantitative or qualitative difference in the behavior of core inflation in the two periods. 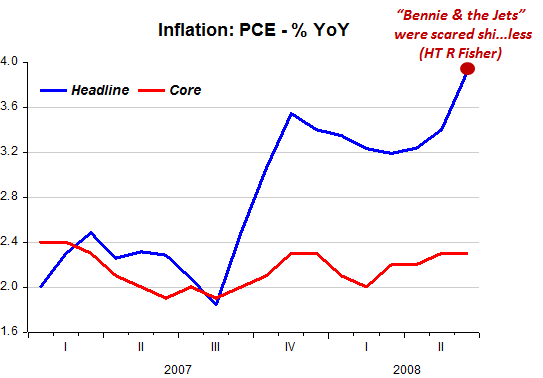 Why did Bernanke ignore the signals from core inflation? The headline inflation is qualitatively similar. 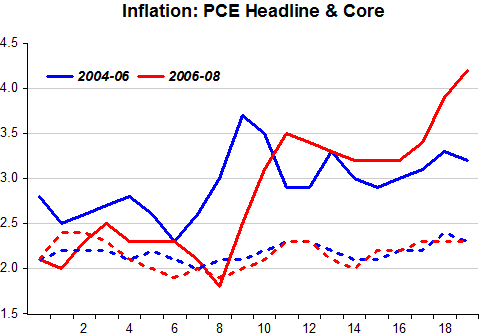 In 2004-06 headline inflation is stronger early on given the timing of the rise in oil prices. Greenspan kept his cool, Bernanke didn´t! Interestingly, to Greenspan longer term inflation expectations were contained. To Bernanke they appeared to be elevated. 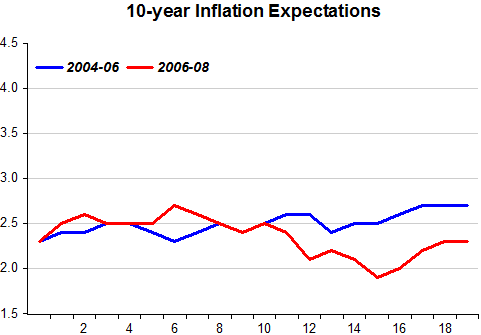 The drop in long term inflation expectations halfway through the 2006-08 period is quite consistent with the Fed´s demonstrated concern with inflation and is also indicative that, contrary to the Fed´s (and conventional) wisdom, monetary policy was “tightening”! Note that the Fed stopped reducing rates in the April meeting and they remained at 2% all the way to October 6 (that´s 3 weeks after Lehmann)! 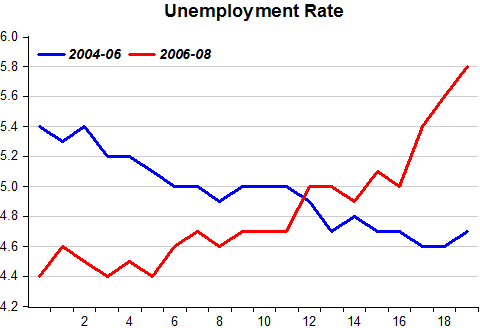 But as soon as the Fed “tightens”, unemployment starts going up. The next chart shows this clearly. In December 07, by lowering the Fed Funds rate by only 25 basis points, less than the market expected (and showing concerns with inflation), monetary policy goes into tightening mode. The spending (NGDP) gap reacts almost instantly and soon unemployment picks up. Bottom line: The oil shock of 07-08 was a trigger for the Fed´s actions. And these actions were inimical to the health of the economy, already weakened by the fall-out of the house price bust. It is clear from the statements, minutes and now transcripts for 2008 that the Fed´s focus was on headline inflation, and since that was being significantly impacted by oil prices, the “public” anticipated monetary policy tightening (a rise in rates). 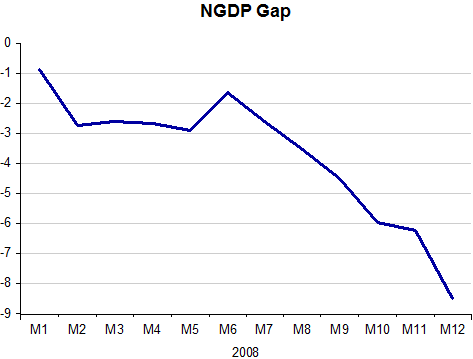 No wonder NGDP dropped significantly (plunging after July 08). Contrast the Fed´s actions and reactions in 2008 to those that took place in 2005, also during a significant rise in oil prices. The behavior of NGDP (here represented by the gap relative to the great moderation trend) is consistent with my view that the Bernanke Fed grossly mismanaged the monetary policy process and should take major responsibility for the macroeconomic consequences that followed. We plugged all 1,865 pages of central-bankery into a computer programme and came up with a few extremely informative nuggets. Nothing to call home about. Just among the lowest on record since the early 1950s! And “insisting” in going lower. It was just a question of time before they would come to the conclusion, given that their brand of stimulus wasn´t very effective, that the problem is “out of their hands”: It´s structural! The maverick in the pack is Kocherlakota. He has travelled the opposite route. Of course, the key question is: How much of the current unemployment rate is really due to mismatch, as opposed to conditions that the Fed can readily ameliorate? The answer seems to be a lot. Early in this recovery Federal Reserve officials debated whether slow job growth was the result of cyclical problems in the economy – namely slow economic growth – or secular problems – such as people not having the right skills for jobs that were available. The consensus that emerged at the Fed was that the root of the slow job growth problem was cyclical, and thus the Fed kept stimulating the economy to promote more growth. A new and different secular vs. cyclical debate about the job market at the Fed is playing out differently. This one isn’t about job growth. It’s about people leaving the labor force. The question is whether people are leaving the labor force for cyclical reasons – again, not enough economic growth or job growth – or secular reasons, such as the retirement of Baby Boomers. To achieve its goals, the FOMC has taken some historically unprecedented monetary policy actions in recent years. But the U.S. economy is recovering from the largest adverse shock in 80 years—and a historically unprecedented shock should lead to a historically unprecedented monetary policy response. Indeed, the FOMC’s own forecasts suggest that it should be providing more stimulus to the economy, not less.